There is a breed of cake that seems designed for the cake dome. These humble treats, often free from icing or much by way of frippery, are ideal for living on the table or counter, under said dome for an anytime pick-me-up. Consider a snitched slice nibbled out of hand with coffee, tucked with milk into a lunchbox or presented with a fork after dinner. These are the easy cakes that feel suited to these days as vacations end and school begins again. This pear and sesame cake makes use of buttery tahini, an increasingly ubiquitous savoury addition to sweet productions, especially with the proliferation of small-batch producers (black tahini, or a smoked style would be brilliant). 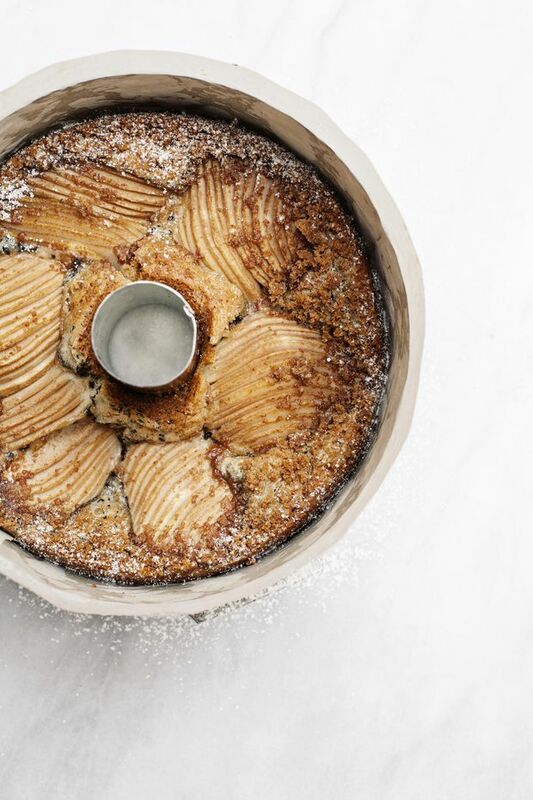 It follows the iconic examples of everyday cakes from Aran Goyoaga, a friend who is also a James Beard Award nominated cookbook author and photographer. My cake can be eaten warm and fresh from the oven – accompanied by a spoon of crème fraîche ideally – but it improves with at least a few hours age. What started out as a pillowy cake with pudding-like smudges of tahini delineated from the crumb settles into something denser. The juices from the pears soak into the tahini below and both seep into the cake to establish a fudgy middle, while the edge retains a chew akin to a brownie plucked from the corner of the pan. Speaking of brownies, the batter for this cake similarly comes together in a saucepan. Into melted butter and sugar go the eggs, a pour of milk and the dry ingredients. The tahini swirl is stirred together in under a minute in its own bowl, with just the sesame paste, honey and sesame seeds (you can use white ones if black aren’t on hand). The batter goes into the cake pan, trailed by dolloped puddles of tahini, followed by sliced pears and a scant streusel. Once baked, it is a golden, quiet beauty, ready and waiting for when the snacking urge arises. In a medium saucepan over medium-low heat melt the butter. As soon as the butter is liquid, move 2 teaspoons to a small bowl for the topping. Raise the heat to medium and continue to cook the remaining butter until it sizzles, then begins to brown (keeping in mind it will continue to cook with the sugar). Off the heat, stir in the sugar. If the sugar does not melt immediately, place back on the stove over low heat and stir until melted. Set aside to cool. While that cools, sort out the dry ingredients and preheat the oven to 350 F, with a rack in the middle position. Whisk the flours, ground pecans, baking powder, salt, cinnamon and cardamom together in a medium bowl. Lightly butter a 10-inch ring cake pan. Line the pan with parchment paper on the outside rim, pressing it into the greased sides. Flip the parchment over, so it’s now butter side out, then press back into place. Flour the bottom of the pan, tapping out excess. Set aside. Once the sugar mixture is no longer lava hot, stir in the milk, followed by the eggs, one at a time and the vanilla seeds. Tip in the dry ingredients and fold to combine. Pour the batter into the prepared pan. In a small bowl, make the tahini swirl. Stir the tahini, honey and sesame seeds together, along with a good pinch of salt. If the paste is too thick to flow off the spoon, add miserly teaspoons of water until it does. Be stingy; it will seize first, making you think you need more, but will suddenly go slack and smooth. It’s better to err on the size of stodge than ooze. Peel, core and slice the pears thinly. Dollop spoonfuls of the tahini across the cake batter. Use the tip of a thin-bladed knife or skewer to marble lightly. Arrange the pears atop, with space between slices so the fruit isn’t too closely packed (this will allow the cake beneath to cook properly). Stir the brown sugar, flour, ground pecans and cinnamon into the reserved melted butter until uniformly damp. Sprinkle the mixture around the edge of the cake batter. Bake in the hot oven until the cake billows up around the pears, looks golden and dry and the cake springs back from a gentle prodding, about 60 minutes. A skewer inserted near the middle of the cake should come away clean. Let the cake cool on a rack for 20 minutes in its pan. Unmold and serve warm if eager, but preferably at room temperature.